Originally written in 2009 but published in English this year by Les Fugitives, Blue Self Portrait is an engaging inner monologue that takes place during a flight between Berlin and Paris, and an amusing study of translation and tangents. Through well-placed memory fragments and occasional conversation between the narrator and her sister, the reader picks up suggestions of the main character’s failed marriage, of heavy drinking, and of a recent romance with a piano player; these personal details are interspersed with thoughts on the music of Arnold Schoenberg, the collected correspondences of Thomas Mann and Theodore Adorno, the differences between the French and German languages, and the politics of art in Europe post-Nazism. In tune with its setting somewhere in the sky, Lefebvre’s prose is airy and liminal, touching on these topics without ever insisting too obviously on any one. Details of the protagonist’s life are sketched in a way that’s often tantalizingly unrealized, giving the reader just enough information to fill in the gaps. A conversation with a love interest – a German-American pianist – is revisited repeatedly. There is something very perceptive about the way Lefebvre recalls the uncomfortable feelings associated with the conversation rather than concrete background details. 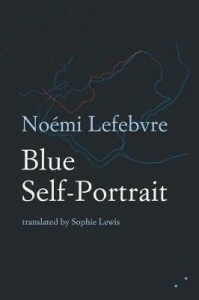 There’s a slight sense that the author is revisiting the cyclical prose of modernist authors – with her repeated statements and convoluted self-definitions, Lefebvre’s narrator could easily be a character in Beckett’s Trilogy or an uncomfortable dinner guest in a Virginia Woolf novel. However, Lefebvre appears to repurpose these modernist narrative styles, updating them to a contemporary context in which they somehow resonate even more effectively. The narrator’s self-awareness seems to make even more sense in the context of our contemporary understanding of gender politics. She crosses and uncrosses her legs in an effort not to take up space; she and her sister share a solidarity based on assuring one another in these moments of anxiety. The prose appears deliberately exaggerated, hyperbolic at times. The farcical aspect of some remembered interactions can feel too heavily sketched, as if every scene is a comedy of errors. Such humour can seem forced at times – such scenes as a description of the main character flailing around in all directions when she plays a tennis match with her former mother-in-law, for instance, or her horror as she rustles a plastic bag looped around her wrist when in the audience at a musical performance, may have benefited from a more deadpan description that lets the awkwardness of such situations speak for itself. However, had the narrative been more minimalistic this would be a different novel, and these exaggerated descriptions do mostly fit with the tone of the narrative, astutely conveying the way in which anxiety amplifies our perceptions of past events. The novel has been translated by Sophie Lewis, who imbues the grammar and sentence structures with just enough strangeness to give the prose a composite feel, complimenting the sense of oscillation between music and words, between French and German, and between caring and, as the narrator repeatedly says, ‘not-caring’, two modes of interaction between which she appears to be constantly torn. Sentences such as ‘I disturb, I’ve never done other than disturb, I disturbed the pianist just like I disturbed a whole pack of people who nevertheless were quite well disposed to me,’ seem almost directly translated from French, unfolding in a convoluted way that doesn’t often happen in English prose. This translated quality renders the stream-of-consciousness narrative even more spontaneous. Blue Self Portrait is ultimately unclassifiable – it reads like a prose-poem or a fragment of a larger work. There is something unsatisfying about its conclusion, but in the best possible way – I found myself wanting to find out more about the characters, to see them in more situations. In short, this is an absorbing and culturally rich story that leaves the reader intrigued, and Lewis’ translation makes it an enjoyable and striking read. Alicia Keane is a writer based in Dublin.